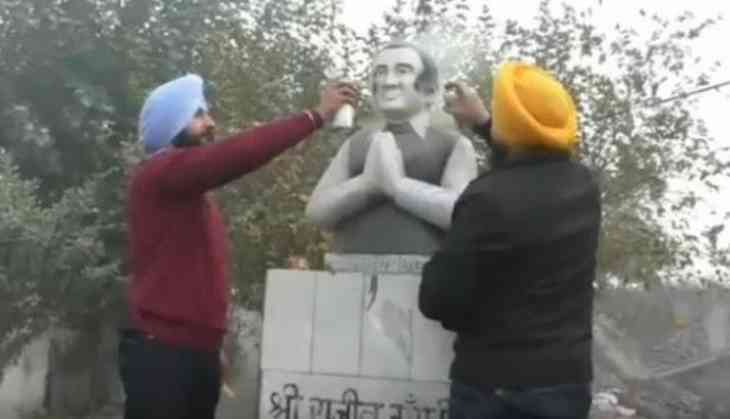 After the statue of Rajiv Gandhi was vandalised in Ludhiana, Punjab Chief Minister Captain Amarinder Singh on Tuesday asked SAD chief Sukhbir Singh Badal to apologise for allegedly indulging in pretty politics. Warning Badal that such acts would backfire on his party in the coming Lok Sabha elections, the Chief Minister also asked the SAD president to "immediately apologise for the obnoxious act of his party workers, who were clearly acting on an agenda to garner votes in the ensuing polls." "Indulgence in such petty and condemnable actions will not absolve you or your family of the many sins of omission and commission against the Guru Granth Sahib and the Sikh community," the Chief Minister further told Sukhbir in a statement. Captain Amarinder Singh directed the district police to immediately identify the culprits responsible for the violence and take stringent action against them, as per law. Lashing out at the Akalis, Captain Amarinder Singh said in their desperation to win public support, which the party had completely lost due to its criminal acts of commission and omission in the 10 years of SAD-BJP rule, "Badals and their supporters were stooping to abominable levels." "They are well aware of the fact that the Gandhis were never named or implicated in the 1984 riots, yet they continued to drag the family into the case to further their own political agenda," said the Chief Minister. Captain Amarinder Singh reiterated that only a handful of Congress, BJP and RSS workers were involved in the violence against the Sikh community in 1984 and the judiciary was proceeding to act against them. "Sajjan Kumar had already been sentenced to life term by the court and others involved in the perpetration of the riots would also face legal action," he added. "Had the Gandhis been involved in any way, they would have been named by at least some of the victims in the wake of the riots," he observed, adding that while he had personally visited the refugee camps to meet the victims, Sukhbir had packed his bags and left for the US and was thus totally unaware of the developments at that time.